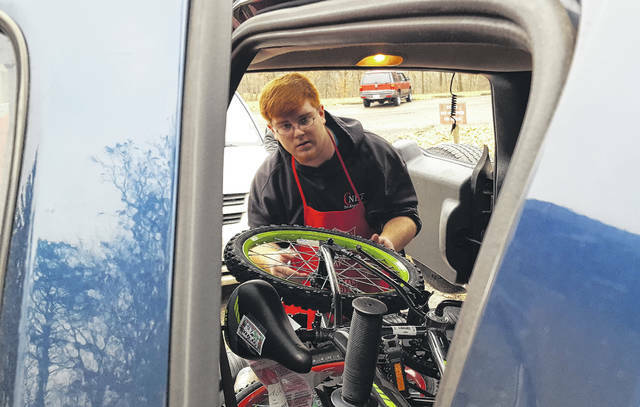 Volunteer Bailey Myers helps load a new bicycle into the trunk of a SUV on Friday during distribution day for The Salvation Army of Central Ohio-Delaware County’s annual Christmas Assistance Program. Myers, along with numerous other volunteers, spent Friday packing vehicle after vehicle with items at The Salvation Army Delaware Worship and Community Center, 340 Lake St. Volunteers Bill Burke, right, and Cassi Byrd, left, spent Friday packing vehicles with toys and food during distribution day for The Salvation Army of Central Ohio-Delaware County’s annual Christmas Assistance Program. Nearly 50 volunteers and staff with the The Salvation Army of Central Ohio-Delaware County spent the past week helping make the holidays brighter for local families in need through the nonprofit organization’s annual Christmas Assistance Program. Captain Mark Larrick, commanding officer for The Salvation Army Delaware Worship and Community Center, said this year the program was able to assist 435 county residents — 218 of which were children — who preregistered in November for help this holiday season. Last year, he added, the program assisted roughly the same number as 423 individuals (202 children) were provided food and gifts through the program. On Friday, those individuals who preregistered for assistance visited The Salvation Army Delaware Worship and Community Center at 340 Lake St. where volunteers handed out approximately 1,300 toys, countless other Christmas gifts (gift cards, afghans, bears, etc. ), and over 140 food boxes containing a variety of canned fruit and vegetables, meat, and toiletry items. Larrick said the food boxes provide five-plus days of food for a family of four. In addition to helping families who were able to get out of the house to pick up their Christmas gifts and holiday meal baskets, local volunteers with The Salvation Army also visited five area nursing home facilities, providing 537 residents with gifts. Larrick said he would be remiss not to thank everyone who makes the Christmas Assistance Program possible year after year, including the businesses and organizations who donate money and items.